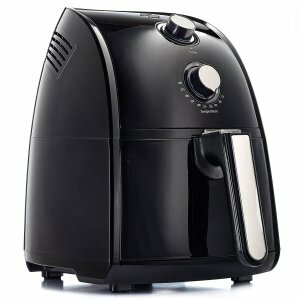 Best Air Fryers / So Which is the Best Cheap Air Fryer? Serve up delectable fried food without unhealthy practices using this convenient Chefman air fryer! Whatever you can deep fry you can air fry! Only it's safer and healthier. Gourmia’s mission is to make everyday cooking easy, healthy, and delicious. The GoWISE USA Air Fryer allows you to enjoy your favorite fried snacks and food without the added calories. Here we detail what we believe are the best cheap air fryer models on the market. 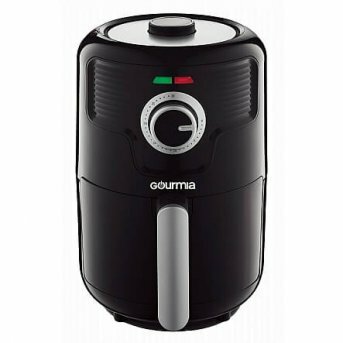 It’s gradually becoming a pretty crowded market, so we thought we’d do you a favour and compile a bit of information about a multitude of air fryers right here! By the time you’ve finished reading, you’ll have hopefully found the model that’s perfect for you in every single way, and you can start to cook up a storm with your brand new kitchen appliance. We include some information about each model so you don’t have to trawl through too many hot air fryer reviews. 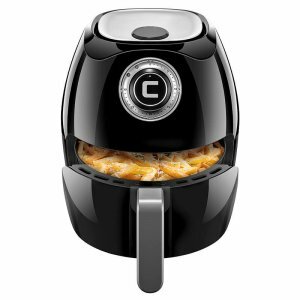 The Chefman has an amazing capacity for food, making this a great choice of air fryer for someone who is looking to cook for the masses. This model also gets you a tailor-made recipe book full of meal ideas. 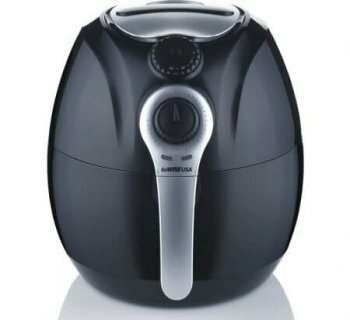 A great little black Air Fryer! The Chefman’s 2.6L basket capacity is impressively big, you will be able to fit a whole lot into this basket which is great news. What’s amazing about this particular purchase is that you also get access to a selection of tailor-made recipes when you buy the model, ensuring you don’t have to worry to much about any bouts of lack of creativity. This is a fantastic little feature as a lot of people struggle to get to know how exactly it works, and what they’ll be able to make. This particular air fryers elements allow for an easy clean, meaning that frying something doesn’t have to be a big ordeal. The handle of the basket can be a bit loose, meaning it might not be the most reliable of models. If you do purchase it, just a keep a keen eye on the joining of the handle to the basket, making sure the screws are as tight as can be. An amazingly cheap little machine that provides you with great fat-free cooking every single time. Its compact size and dual dials make this a really easy model to use in any kitchen. Many customers are astounded by the quality of this fryer based on its price, it’s very easy to get drawn in by the more advanced, more expensive models, but this one has it all for a very cheap price. People have found it very easy to use and praise its versatility when it comes to frying foods. It seems that this is a model that really allows for some improvisation. It has a compact and helpful design. The most important parts that the Bella is missing is both an automatic shut off button and an adjustable temperature control which can be a bit troublesome. This air fryer has a bit of a smaller capacity than the other ones on the market this means that it might be good for someone who is cooking alone or possibly two people. It’s got a wide temperature range with a cute design too! Its fantastic design allows it to fit into any sort of kitchen environment. It’s important to have a fryer that looks attractive and enticing, and this model certainly is! Its ingenious method allows for a complete lack of noise when it is being used. This model includes an amazing recipe book. Some have reported a fault where it will get stuck around the 20-minute mark, you’ll just need to keep an eye on it if you are cooking anything for that long. But with a price tag like it has got, you’re getting a good deal! A state of the art machine that uses Rapid Air Circulation Technology to cook food to a perfect degree! Using very little oil ensures that the food you cook is healthy! This particular air fryer has a great cooking capacity so is perfect for those that are looking to cook for a lot of people in one go. Its basket can take a whole lot of food without their being any issues in terms of cooking. It’s a powerful model so cooks things extremely quickly for those that are looking to waste no time with their new appliance! However, some state that it can make quite a bit of noise, and that the finish on the outside isn’t the best they’ve ever seen. However, it is still a desirable model for any home cooks! It can be so hard to know what is right for you. Especially when it comes to kitchen appliances, that can so often prove to be faulty or inferior in some way. When you are buying something with these sorts of price tags on, you want to make sure that you’re getting the best product you can get. Hopefully by now, after reading through each of these little reviews of a selection of different air fryers, you have a bit more of an idea of the one that you think is going to transform your kitchen. Transform it from a humble cooking space, to a fantastic battleground of flavours and spices.If you are still not sure about which one you want, have another look through the list and see if you can find any that you prefer through searching on your own. The right one for you is out there somewhere, it is just waiting to be found. Locate it, and you’ll be cooking the best meals of your life!